VIENNA - The government and the International Atomic Energy Agency have signed an agreement to work together to keep the 2020 Olympics safe from nuclear terrorism. According to the Foreign Ministry, the agreement includes measures to support the participation of IAEA experts in related events, exchanges of information on nuclear security issues, and the loaning of radiation-detection equipment to Japan. Foreign Minister Taro Kono and IAEA Director-General Yukiya Amano observed the signing of the agreement in Vienna before a meeting at which Kono said they agreed to flesh out cooperation in thwarting nuclear terrorism. 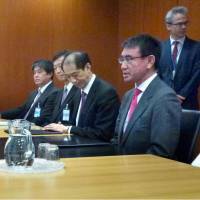 “We want to thoroughly cooperate with the IAEA to make sure the Olympics are safe,” Kono said at the outset of the meeting. Kono and Amano, a former senior diplomat who became the IAEA’s director-general in 2009, also agreed that it was important to work more closely to engage North Korea on resuming IAEA inspections there. The U.N. nuclear watchdog has not had direct access to North Korean nuclear facilities since its monitors were expelled in April 2009. After the meeting, Kono told reporters that in the event the IAEA is able to re-enter North Korea, Japan would assist with the initial costs of securing the necessary equipment and personnel. “We want to make arrangements so that if it becomes possible for the IAEA to make inspections, it can do so immediately,” he said. 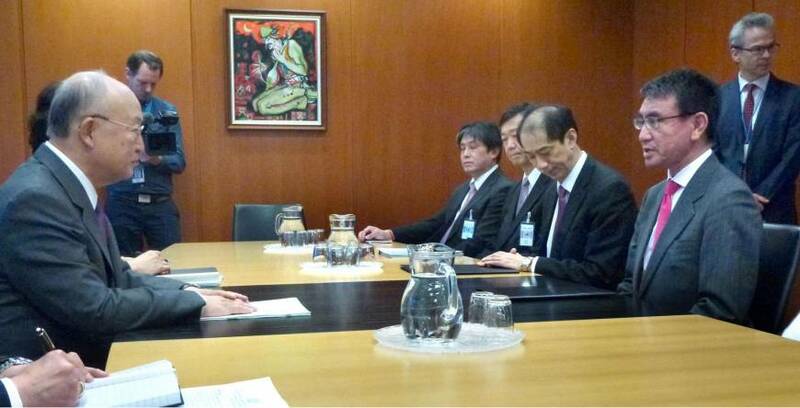 Ahead of his meeting with Amano, Kono met Thomas Greminger, secretary-general of the Organization for Security and Cooperation in Europe, and agreed to maximize pressure on North Korea over its nuclear weapons and ballistic missile programs. Kono, who arrived in Austria earlier on Thursday, will travel to Germany to participate in the Munich Security Conference on Friday and Saturday. According to officials, he will focus on appealing to the international community to tighten the vise on Pyongyang.